Amaliya Preobrazhensky lives with her mother in a tiny apartment. They don’t have much except each other … but that’s all right. Every day, God provides. When Amaliya’s father, who hasn’t been around since before she was born, returns and a custody battle begins, it’s hard for her to understand. Can a man she’s never met really take her away from her beloved mother? Why would God let such a thing happen? This short story/novelette is a perfect afternoon read for both tears and smiles! Baby Mine is a standalone late 1940s short story. Where can I buy Baby Mine? 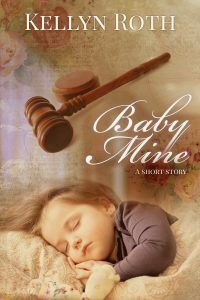 If you’re interested in reviewing Baby Mine on Amazon, Goodreads, or your blog, you can shoot me an email at kellynroth@gmail.com. I’d love to send you an eBook copy in exchange for review. What age-level is Baby Mine written for? Is Baby Mine a clean book? Yes, it is! There is some situational content (an unwed mother, etc. ), but nothing is described, and it is through the eyes of a five-year-old girl.